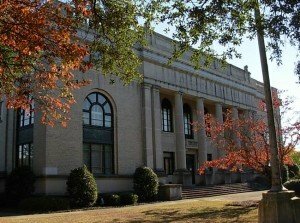 This stately Georgian-Revival courthouse, serving Calhoun County, stands in the heart of St. Matthews and was built in 1913. 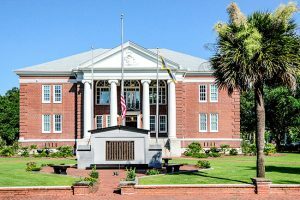 This structure is one of nine South Carolina South Carolina courthouses designed by noted 20th century architect William Augustus Edwards, other examples can be seen below. 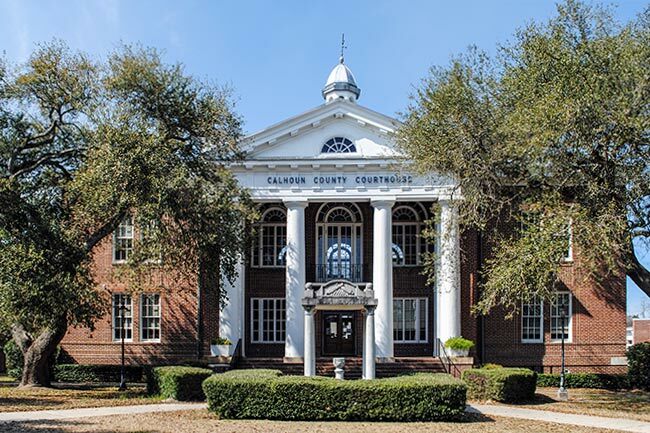 The courthouse was built to serve the newly formed county, named for John C. Calhoun. The town of St. Matthews donated $20,000 towards construction costs and two prominent residents contributed the remaining funds needed to complete the project. 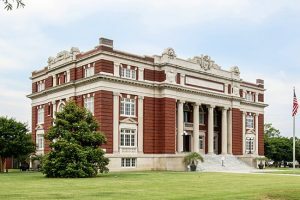 Calhoun County Courthouse was built in 1913 and designed by renowned South Carolina architect William Augustus Edwards. The courthouse is a two-story brick, Georgian Revival building with a colossal Doric portico on the south elevation. The tetrastyle portico projects from a central three-bay entrance pavilion. The columns of the portico are of stuccoed brick with the proportion and detail of the Greek Doric order: no bases, the diameter broad in relation to the height, and annulets on the lower part of each capital echinus. The entablatures of the portico are executed in wood. It consists of a bipartite architrave, followed by a Doric frieze, with alternating triglyphs and metopes. A taenia beneath the triglyphs features wooden guttae. The courthouse has a hipped roof. A cupola at the crest of the roof is octagonal, painted white, with open arcaded sides, an entablature, and an octagonal dome of pointed profile, sheathed in metal and crowned with a windvane. 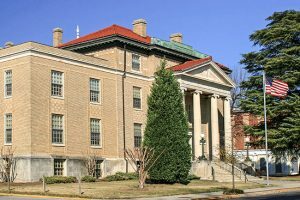 The cross-axis plan courthouse was built to serve the newly formed Calhoun County, named for South Carolina Statesman John C. Calhoun. 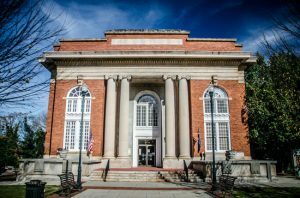 The county seat of St. Matthews donated $20,000 toward construction costs for the courthouse and two prominent local residents donated the construction site. 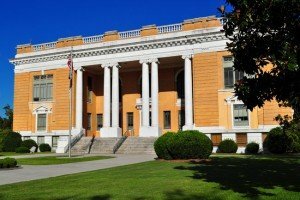 Interior details are restricted to the courtroom, where they are used to reinforce the authority of the judge, as representative of Law, Order, Justice, and Calhoun County. Listed in the National Register October 30, 1981.